confess You as the one Judge of (all) hearts and minds. with hymns. We Your flock call you supreme King of all. Your love, gather together in one flock those wandering astray. Father and the loving Spirit through endless ages. Amen. Note: The above music is from the Cantus Selecti (Abbaye Saint-Pierre de Solesmes, 1949, pg 94). 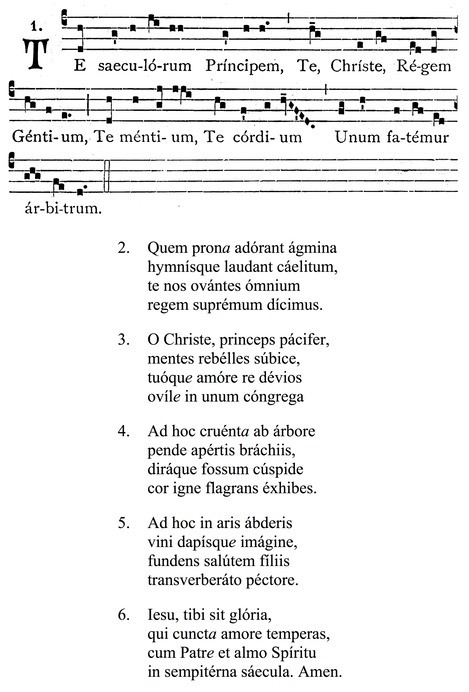 The Latin text is from the Liber Hymnarius (Abbaye Saint-Pierre de Solesmes, 1998, page 122) and used with permission from The Abbaye Saint-Pierre, Solesmes, France. To obtain the music with updated notation, please purchase the Liber Hymnarius ( solesmes.com ).